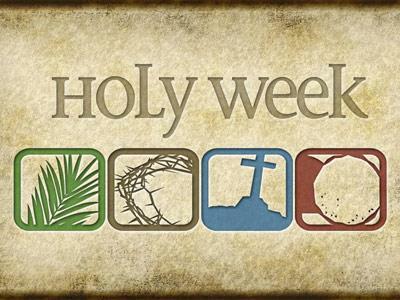 We are about to enter Holy Week. The setting for the entire week is Jerusalem and Bethany. There is so much going on that we can’t possibly cover it all in worship. However, I wanted to give you an overview of the most important week in Christianity. Here is a possible timeline of the events of the week. Returns to Bethany at night. Possibly, on Wednesday, the supper and anointing in Bethany at the home of Simon the leper. (Mt 26:6-13; Mk 14:3-9; Jn 12:1-8) Mark’s account is just after he says that it was two days before the Passover. Agony in the Garden of Gethsemane; the betrayal of Judas and the arrest of Jesus. Jesus was kept overnight in a cistern below Caiaphas’ home. Holy Saturday: Jesus’ body in the tomb. See! A lot going on! 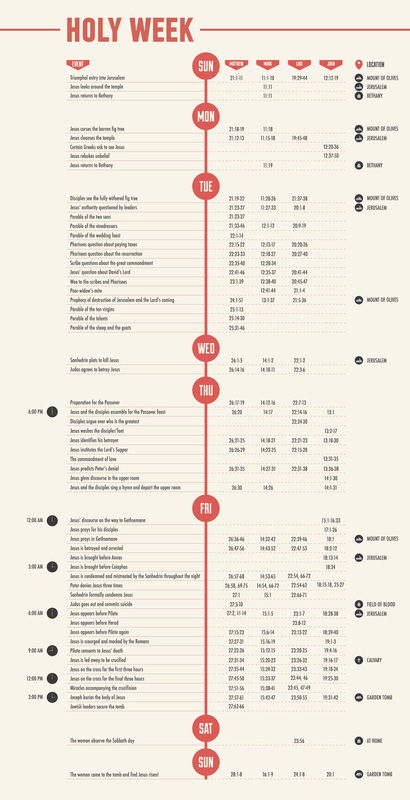 I have also attached a graphic of another timeline for you to look at. Even if you don’t read the entire timeline, please take the time to come to church this week. Make the journey from the gates of Jerusalem to the upper room, to the cross and finally to the empty tomb. This was a surprise to me, and now I see that this unsettling gap in the gospel accounts has been filled by an answer from tradition. Wherever he was held, it must have been a night of intense prayer, perhaps even more anguished than in the garden. No human companions, only the Son with his Father. This will be on my mind today.